A batch of badly-behaved terrapins which have been terrorising ducks are being rounded up in north London. A group of children were alarmed to see the reptiles attacking ducklings in Sheepwash Pond, Mill Hill. 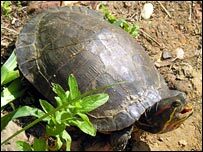 London Wildlife Trust volunteers are now baiting the red-eared terrapins with chicken legs in an attempt to remove them to a sanctuary in Tuscany. Known as a feral and invasive species, they are bought as pets but dumped as they can grow to be up to a foot long. In Mill Hill, 11 have been caught so far, said Tim Webb, from the London Wildlife Trust. "There were children very upset at seeing these ducklings being eaten in front of them," he said. The trust wants to see a national policy on dealing with the red-eared terrapin, originally from America, which are among the 100 most invasive species in the world. Their popularity was fuelled by the Teenage Mutant Ninja Turtles cartoon craze of the early 1990s, but as they grew, many owners released them into the wild. Mr Webb added: "You can buy them as babies when they are tiny - the size of a 50p piece but they can get quite large and give a nasty bite." Now hundreds are on the loose in London and potentially thousands in ponds across the UK, eating ducklings, duck eggs, fish, slugs and snails. Four years ago another group was rounded up in Highgate after attacking ducklings in Waterlow Park, and was also "deported" to Italy. British waters are currently thought to be too cold for the terrapins to reproduce but climate change could change that, said Mr Webb.